The home of David Ben-Gurion, Israel's first prime minister, and his wife Paula, is located on Kibbutz Sde Boker. The home has been preserved exactly as it was on the day of the prime minister's passing in 1973. Three exhibitions were recently opened on the kibbutz, each showcasing David Ben-Gurion's personality and ideals in innovative ways. The first home built in the area features a fascinating display centered on Kibbutz Sde Boker, the late prime minister, and his vision for the Negev. In the adjacent building, visitors are invited to play fun computer games that focus on the Negev, the IDF, and the role of Israeli youth. The third new exhibition includes a movie that celebrates Ben-Gurion's leadership, projected on a large screen. Additional attractions on or near Kibbutz Sde Boker – just a quick drive from Ben-Gurion's home – include the Midreshet Ben-Gurion field school, and David and Paula Ben-Gurion's graves, located at the heart of a gorgeous national park with footpaths, cliffs, and verdant meadows, where visitors can admire breathtaking views of Nahal Zin (Wadi Fikra) and Ramat Avdat. Call +972-8-656-0469 to arrange your visit in advance. 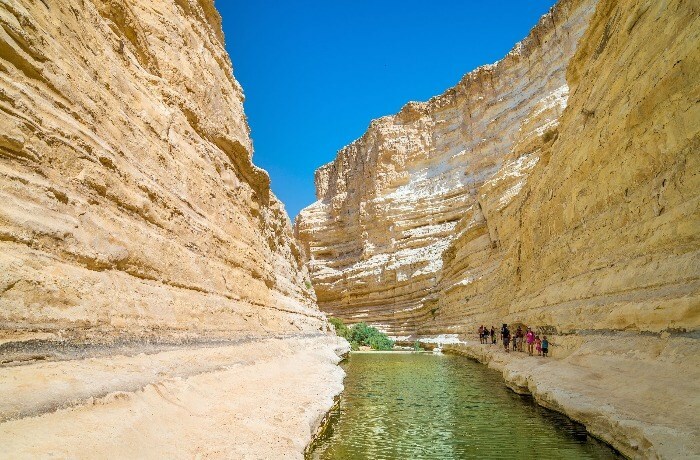 This national park includes a section of the spectacular Nahal Zin (Wadi Fikra), which cuts through the stunning Ein Avdat canyon. Visitors are invited to look out over Nahal Zin from the northwest side of the Zinim Cliff, which climbs to a height of more than 100 meters, between Ramat Avdat and the Zin Valley. The park itself is an incredible 480 hectares! Ein Avdat is home to the most beautiful oasis in Israel. Thanks to its large size and ideal location in the heart of the desert, this oasis has become a vital resource for desert animals, especially ibexes (wild goats). The towering, inaccessible cliffs are the most important vulture nesting sites in Har HaNegev. In addition to majestic animals and water, Ein Avdat features awe-inspiring landscapes, cliffs, and fascinating archaeological remains from a Byzantine-era monastery. Visitors can explore the monks' seclusion caves overlooking the canyon. The sublime Ein Avdat waterfall, with a fairytale pool at its foot, is also located inside the park, along with an impressive collection of desert poplar groves, which mostly grow along the Jordan River. These trees are especially beautiful in the fall, when their leaves turn a gorgeous yellow color. Dial +972-8-655-4418 / +972-8-655-5684 to coordinate activities. Directions: Off Highway 40 (Beersheba – Mitzpe Ramon). The lower entrance to the park is located near Ben-Gurion's tomb and Midreshet Ben-Gurion, while the upper entrance is some 5km south of those two attractions. Simply enter "Ein Avdat National Park" in your preferred navigation app. The Nitzana Hillocks Park, close to the Egyptian border, is home to intriguingly-shaped, naturally light-colored chalk mounds. These white, rounded, and twisted chalk rocks have been formed through natural erosion. Visitors are invited to play, take pictures, and enjoy this desert wonder. The area also holds fascinating million-year-old nummulite (Latin: "little coin") fossils, from a time when coin-sized creatures roamed the seabed (now a desert). It's best to visit in the afternoon so you can witness the immense beauty of the sun setting low over the rocks. Directions: 2km from Nitzana Junction, you will see a sign for the Nitzana Hillocks, and the site's adjacent parking lot is only a short distance away. Near Nahal Zin flows a spring that "paints the desert green", serving as the main water source for desert wildlife, and lifting the spirits of all who come to bathe there. Lower Ein Akev is a contact spring. The water flows from the top of a waterfall, descending into a round pool some 7 meters deep. The pool is full of water year-round, feeding the dense natural vegetation, as well as the ibexes and other animals in the area. Ein Akev is one of many contact springs that flow along the northern boundary of Ramat Avdat. Rainwater seeps into the spring's layers of horizontal chalk rocks, stopping at its impenetrable marlstone strata. The water is therefore forced through the soil (above the marlstone) and bursts out at the edge of the cliff. Directions: Drive south on Highway 40. After passing Sde Boker, take the turn toward Midreshet Ben-Gurion. At the traffic circle, turn right, according to the sign. The route itself is marked. Walk 3.5km to an intersection with a blue path, and turn right according to the sign. The parking lot is 2km from there, and the spring is about 750m from the parking lot. Please note that the drive to Ein Akev is long and moderately difficult, and is suitable for 4x4 vehicles. 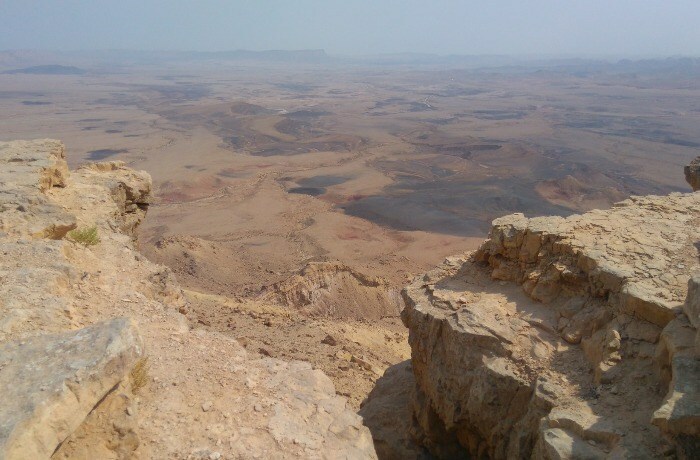 The Ramon Crater, or Makhtesh Ramon, is about 40km in length, and is considered the world's largest and most impressive erosion cirque (colloquially known as a crater). This unique natural phenomenon resembles a huge grinding bowl amid the Negev's mountain ranges, and offers a glimpse into the many charms and secrets of the desert. Visitors standing at the edge of the crater will be amazed by the stunning desert landscape. But to get the full experience, you have to become part of that very landscape – descend into the crater, explore its unique trails and sites up-close, and enjoy the remarkable window it opens into the geological world of ancient animal fossils, multicolored sands, volcanic rocks, and more. Ramon Crater Visitor Center: Located on the northern edge of the crater, the center enjoys a breathtaking view of this remarkable natural phenomenon – especially from its rooftop. The center also offers an audiovisual show that explains the Ramon Crater's formation. Visits to Makhtesh Ramon Visitor Center must be arranged in advance. Please note that entry to the museum closes one hour before the posted time. Simply enter "Makhtesh Ramon Visitor Center" in your preferred navigation app. In the heart of the desert, high up on a hill above Nahal Zin, you will find the impressive ruins of an ancient Nabatean city that stood for around a thousand years – from the early Nabatean period to Byzantine times. The city was named in honor of the Nabatean King Obodas I, who was buried there. When the ancient city was founded, it was a vital station along the region's Incense Route, which flourished mainly in the Byzantine era. Following a devastating earthquake in 630 CE, and the subsequent Muslim conquest in 636, the city gradually fell from prominence, until it was finally abandoned completely. Recognized as a UNESCO World Heritage Site, Avdat is one of the best-preserved Nabatean cities In Israel. Here, visitors will observe the city's ancient archeology, including the systems it developed for agriculture and water cisterns. Visitors are also invited to watch a short film about Avdat, available in several languages, and tour its main attractions: the bathhouse, a magnificent Roman burial chamber, the citadel, and two Byzantine churches. Directions: Close to Highway 40, between Sde Boker and Mitzpe Ramon (15 minutes from Sde Boker). Simply enter "Avdat National Park" in your preferred navigation app. Jeep Tours: Dror BaMidbar offers various activities customized to suit the preferences and available time of each visitor. The air-conditioned jeeps are driven by experienced crewmembers, who know the desert and its trails like the backs of their hands. Dror BaMidbar also provides special tours for family groups, with stops for coffee and desert-style herbal tea. These tours are accompanied by fascinating explanations about desert survival, ancient cities, the Incense Route, and Nabataean life, as well as an explanation of the springs, plantlife, and animals in the area. Sandboarding: You've heard of snowboarding. Now try sandboarding, an unforgettable activity in the magnificent Negev dunes. The activity is suitable for everyone, with no prior experience necessary. Visitors will have a blast surfing on sandboards while sitting or lying face-down, in pairs, and even backwards. Special sandboards are available so children can surf the dunes with their parents. This activity also includes coffee and tea served while sitting on a mat with mattresses and pillows. Call Dror at+972-8-675-3636 to make arrangements. Visitors enjoy a variety of exciting desert attractions, including authentic Bedouin hospitality, a unique tracking workshop, and camel treks. Camel Treks: This activity in the hills of Bir 'Asluj includes riding to an enchanting observation point overlooking Golda Park, walking up to the observation point, and then riding back to the farm. 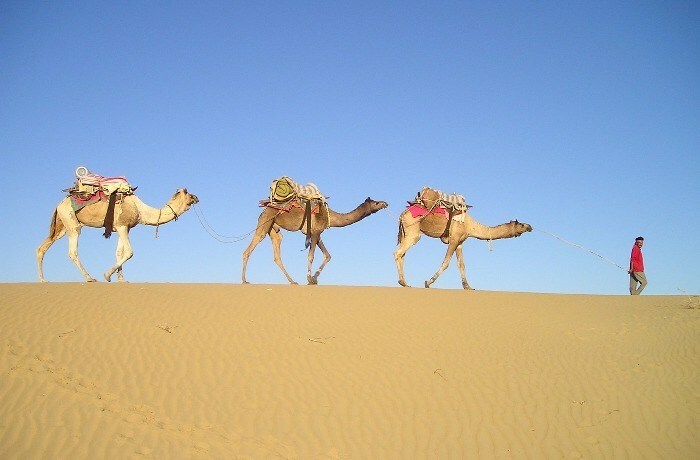 The camels are equipped with double-seat saddles, so visitors ride in pairs. The activity lasts about one hour. The farm is home to a herd of trained, well-groomed camels. A shorter trip that lasts about half an hour in the Bir 'Asluj area is also available. A maximum of 22 people can participate in each trek. Tracking Workshop: This activity takes place in the adjacent Makman dunes. During the workshop, participants will learn about the work of trackers, how to trace the tracks left by animals and people, distinguish between different tracks, determine who they belong to, and hide your own tracks. The group will try to track two of their friends, for a unique, unforgettable experience. The group will be guided by a professional, IDF-trained Bedouin tracker. The activity lasts about one hour. There is an option for group sessions and tasks during the workshop. Each group can include a maximum of 25 participants. Traditional Bedouin Hospitality: A fascinating explanation of the Bedouin hospitality ceremony, including preparing and grinding coffee, the Bedouin tent, a taste of the Bedouins' daily life and worldview, and more.